Well this is the post where I write a bit of a confessional, a don’t do what I did, and offer a bit of advice. I had shared/whined a bit about an injury to my foot for the past month. I experienced some serious Achilles issues that wouldn’t go away and finally got some help from my awesome PT friend. We found the source of the issue on a physical level but two days ago I had one of those Aha! moments. 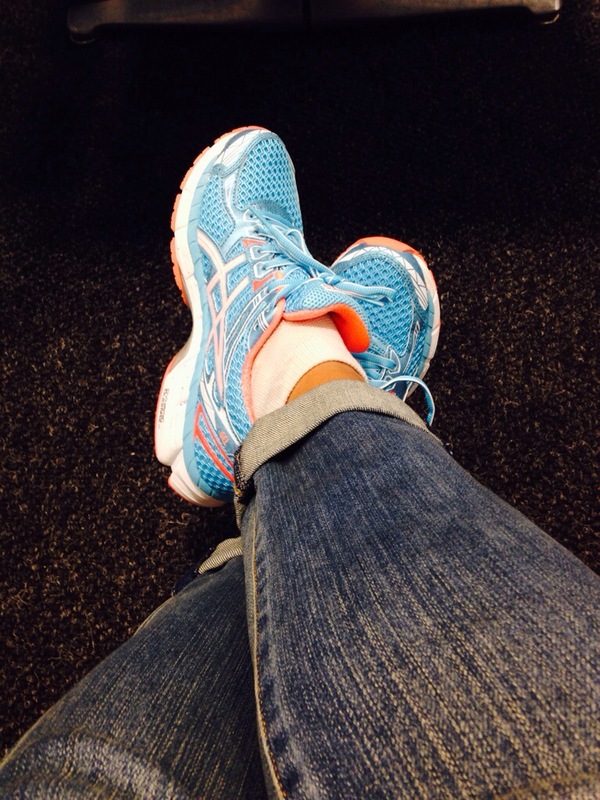 My friend has asked me multiple times what shoes I have been wearing and I confidentially kept pointing to my Asics. He asked if I was wearing orthotics and I kept confidently pointing to my Superfeet. I had also just been to my totally awesome massage therapist who was able to pinpoint the injury and grabbed my ankle and said something was going on there when I was running and he would love to know what it was. Flash back to a shoe shopping excursion back in April where I spotted some really fun looking Asics. The girl in the store pointed to my shoes and said, “Yours are a stability shoe and that is a neutral.” I shrugged it off and told her I didn’t buy them for the stability it was just the shoe I had been running in for 2 years. And then I bought the cool blue shoes. You see, that space I was feeling, that extra room, was due to the shoe being “neutral.” For over a year I had been wearing a shoe that firmly held my heel in place. Changing this was the cause of that ankle and heel movement that my massage therapist was trying to pinpoint. This running coach is the source of her own apparent self inflicted injury. All for the sake of fun colored shoes! The lesson here? When you need a good pair of shoes go to the expert. Take the time to get properly fitted and find the shoe that works for you. Once you have done this and know what works you can then buy online or on your own. But stick to the parameters that work for you. Ease into your new shoes. Don’t put them on and do your 20 mile Saturday long run for your first run. Walk around in them. Use them for short runs at first. If you are training for a half or a full marathon consider buying two pairs at the beginning of training. Alternate between pairs and you won’t have to break in another new pair until after your race. You will be able to spread your mileage out between the two and have a sturdy but trusted pair for your race. If you have had issues with your feet consider adding some support inside. I had a nagging bout of plantar fasciitis a few years ago. I found Superfeet to be a great help. They come in all sizes and levels of support. They even make ones for high heels and also for ice skates. I have a pair I switch in and out whatever shoes I chose to wear for various occasions. Most importantly don’t buy a pair of shoes based solely on their color. This is not going to help your running and hopefully you are moving so quickly on the road that no one has time to notice what color your shoes are. This technique will only leave you feeling blue as you watch the green bleed from your wallet trying to fix your aching body. Great, great advice!!! You are so knowledgeable about running + everything that goes along with it (gear, etc.)! Have a Happy Friday!!! XOXO!!! Thanks Kristin. Now to make sure I follow my own advice. Have a great weekend. Haha!!! 😉 Thank you!!! Have a great weekend, too!! XOXO!! Thanks for the great advice!! I just had my first long run this morning and thankfully I was smart enough not to wear my new shoes haha thank goodness because I could totally see some nasty blisters in the near future if I did! Most definitely with the blisters. Forgot all about those ugly guys. I had a very similar problem twelve years ago. From my heel to the ball of my foot is a size 11 but I have short toes so it appears on the measuring device that I’m a size 10… After a year of running in shoes that were a size too small I was darn near crippled. I needed three months off. After switching to 11’s I never had a problem with running again. Unbelievable. So glad you figured it out and are better. What a mess! When I took my daughter to buy her first pair of running shoes she was mezmerized by the pretty shoes on the wall. I told her not to select a shoe based on the color. I’ve worn red shoes and yellow shoes. If my model and size came in pink, that’s what I’d wear. For me shoe are more of a utility buy than a fashion statement, It’s my feet after all! Exactly. Wise words. I knew better. I’ve never cared about color before. One dumb mistake later…..
It’s an important lesson which is easy to forget – I had similar problems quite a few years ago – getting shoes that were for over-pronation when I am at the under-pronation end of neutral led to Achilles and back problems which were quickly resolved by a new cushioned pair. Glad that you have sorted the problem out though. Awesome advice. Thanks! Glad you figured yours out too. Yeah, I’ve gotten into a mess even when buying the shoes I’m supposed to wear (a few years ago, the Mizuno Wave Inspire was NOT ANYTHING like the old pair that I had and I ended up getting pf); now I ONLY go to a specialty shoe store…except when my husband buys me Wave Riders for Xmas, lol. That’s crazy. So glad you figured it out. I’ve had custom orthotics since 9th grade, and you couldn’t be more “preaching to the choir” than talking to me about the importance of good, properly fitting shoes and inserts. They have made the biggest difference for me, but I do need a back up pair, I will definitely look into Superfeet. What Asics are the right ones for you? I run in Nimbus but also run in Brooks Glycerin. I am shopping for new shoes and wondering if I should stick with what I currently wear. Oh yes, I learned a few years ago how important it was to get proper shoes from the ‘experts’. Whenever I test a different pair of shoes, I can really feel the difference, and it doesn’t feel good usually. I feel like finding the right shoe for running is one of the hardest shopping issues ever. But you’re right, it’s definitely worth it to find the right fit. I’m still trying to figure mine out. Fairly new to running and when I stopped “heel” running last year, I went into new shoes because the old shoes weren’t cutting it. I’m still aiming for a mid-strike but have been told I’m more of a toe runner (which is slowly working its way out as I get better and faster with running and my stride isn’t so shuffled). So now I’m dealing with a fair bit of calf pain and prone to shin splints but I “think” it’s more that I’ve never done much volume before and need to gradually build up. But I was thinking about getting fitted again and at least having 2 pairs of shoes to swap between. Finding the right running shoe is definitely a the Holy Grail for all runners! I’m glad you figured out your injury issues – it’s easy to get distracted by some pretty kicks! I guess the thing for me is that I’ve had some injuries but have never been able to attribute them to my running shoes. Not all injuries come from “bad” shoes, right? But how can you know for sure if you need to change it up? Thanks. I thought that was a fun way to look at your shoes. Really good advice. I have made the mistake of buying shoes based on cuteness in the past and ended up injured. Never again. How about a momentary whine. Why can’t they make cute shoes for our feet?! Just slightly kidding. Great advice and a lesson I learn more often than I should (you think it’s only take once). I’ve also had to learn that my shoe needs change – what worked last year won’t always, which means I have to constantly be aware! Why must shoes be so difficult? Seriously! Yeah nothing like a running coach running in the wrong shoes. Talk about dumb!